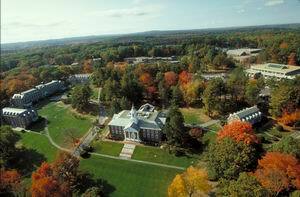 The course will be held at the Executive Conference Center on the campus of Babson College in suburban Wellesley, MA, 20 minutes from downtown Boston and Logan International Airport. Residing at the conference center is strongly recommended, even for local attendees, so that you may benefit from the retreat-like nature of the course. The ABS has negotiated a special conference center hotel room rate which includes full breakfast and complimentary wifi. Amenities include a modern fitness center and walking trails. Note: When booking your room, you'll need to enter ABS2018 in the group code to secure the conference rate. Rate available through September 14, 2018. Boston, birthplace of the American Revolution, is located approximately 10 miles from the conference center. It is an eminently walkable city, whether you follow one of the historic paths (Freedom Trail, Black Heritage Trail, Irish Heritage Trail) or wander “freestyle” through its distinctive neighborhoods: Back Bay, Beacon Hill, The North End, Chinatown, and Boston Harbor. Museum-goers will have to choose between the Museum of Fine Arts, The Isabella Stewart Gardner Museum, and the many Harvard museums across the Charles River in Cambridge. Fun shopping and distinctive restaurants for all budgets share space on Newbury Street, Prudential Center, and Faneuil Hall Marketplace. In accordance with ACCME requirements on disclosure, information about relationships of presenters with commercial interests (if any) will be included in materials distributed at the time of the conference. Registration Deadline: September 14, 2018. Registration fee includes syllabus, refreshment breaks, 2 dinners and one lunch (see Full Schedule). A discount of $100 for current active ABS members (plus 20% for student members) will be applied during online registration. Those registering at the non-member rate will have the option to opt-in for a one-year ABS membership following the conference. Current members of other countries’ Balint societies also qualify for a registration discount. They should contact Eran Metzger, Conference Director, by email before registering: metzger@hsl.harvard.edu. Registrants wishing to cancel their registration must do so in writing by the cancellation deadline of September 14, 2018. For cancellations received by the cancellation date, $100 of the registration fee will be withheld for administrative fees and the refund will occur after the intensive has been held. For cancellations received after the cancellation date, no refunds will be available. The Boston Leadership Intensive course is appropriate for clinicians new to the Balint Group method as well as experienced Balint Group leaders. The course is well-suited to those who are currently leading, expect to lead in the future, or are seeking a better understanding of Balint groups. The curriculum is appropriate for physicians (primary care, psychiatry, other specialists), psychologists, social workers, other mental health care providers, and pastoral care providers. This live activity, Boston Balint Leadership Training Intensive, with a beginning date of October 11, 2018, has been reviewed and we have applied for up to 19.25 Prescribed credit(s) by the American Academy of Family Physicians. Physicians should claim only the credit commensurate with the extent of their participation in the activity.